For most, a divorce is a foreign, complex and highly emotional process. Once a party has decided to divorce or has been served with a divorce complaint, the issues that take the forefront are the ones which affect a party’s everyday life – how will expenses be paid, where will each party live, how often will each party see any children born of the marriage, how will income and assets be affected. However, a divorce causes a radical change in both personal situations and finances and estate planning objectives. Due to the immediate effect that a divorce has on a party’s everyday life and financial responsibilities, parties often overlook the need to update their estate plan. Contrary to what many believe, updating an estate plan or creating one is not something that should be done after a divorce; it is something that should be discussed as soon as a complaint in divorce is filed. If you or your spouse has filed for divorce and you do not have a will, it is time to have one drafted. If you have a will, this is the time to get it updated. If, at the time of a party’s death, the grounds for divorce have not been established in Pennsylvania pursuant to section 3301 et al. of the Divorce Code (which could take up to two years from your date of separation), the divorce will abate and each party resorts to the rights created by laws like the Retirement Equity Act, the rights of joint owners to the decedent’s interests and the elective share under the Probate Code. If there is a will, the surviving spouse has a right to take “against” the will under the Probate Code thereby claiming portions of certain asset classes. However, a will is beneficial at this juncture as it can control how property not assigned to the surviving spouse is distributed. After the grounds for divorce are established, the divorce does not abate and the marital estate (which includes the decedent’s estate) remains subject to equitable distribution with the executor (if there is a will) or administrator (if there is no will) for the decedent being substituted as a party for the decedent. The decedent’s share of the marital estate as determined in equitable distribution will then go to the beneficiaries under the decedent’s will. Having a will gives a party the ability to choose exactly who those beneficiaries are and who the executor is. Otherwise, the Probate Code will control those decisions. It must be noted also that Pennsylvania law mandates that any provisions in a decedent’s will that leaves part of their estate to his or her spouse is presumed ineffective if the decedent died during the course of divorce proceedings after grounds for divorce were established. Furthermore, drafting or revisiting a will early in the divorce process may reveal issues that need to be addressed in a property settlement agreement. If a will is not updated or drafted during the pendency of a divorce, it is essential that it is done thereafter. Regardless of the type of policy you have, the beneficiary should be revisited. If the spouse is the named beneficiary, the beneficiary should be changed to a carefully selected adult. If a party wants a child and/or children to be listed as the beneficiary(ies), a trust should be established to be administered by a trustee of the party’s choosing providing for distributions for the benefit of the children for purposes as the party deems appropriate. However, discuss any changes with a family law attorney first. Upon application, pursuant to Section 3502(d) of the Pennsylvania Divorce Code, the court may direct the continued maintenance and beneficiary designations of existing policies insuring the life of either party which were originally purchased during the marriage. A party will be required to comply with an order entered in this regard. If you do not change your beneficiary designation from your spouse or are court ordered not to do so, there is some protection under the Pennsylvania Probate Code. Under the Probate Code, once the grounds for divorce have been established, any designation of a spouse as a beneficiary of non-probate assets such as life insurance policies (also to include bank accounts, annuity contracts, retirement accounts such as IRAs and 401(k)s) becomes ineffective upon the death of a spouse so long as the beneficiary provision was revocable in nature. Assets that had the spouse listed as beneficiary by will or otherwise would pass to the residue of the estate under these circumstances (yet still be subject to equitable distribution if marital property). The surviving spouse is treated as though he or she predeceased the owner of the asset unless there is language specifically indicating there was an intention for the surviving spouse to remain the beneficiary of the asset post-divorce. However, non-probate assets governed under ERISA such as certain life insurance policies, pension plans, and other retirement accounts are exempt from this law as the ERISA federal statute preempts Pennsylvania state law. Regardless, once a divorce decree is entered, all beneficiaries should be updated to persons of your selection. Numerous times, I have been asked, what will happen to my children if I die? Many divorced parents are not comfortable with his or her ex-spouse being the sole custodian of the children. A revised estate plan can include the designation of a guardian for the children. Although recommended, this is not binding on a court. An agreement in custody is an additional option which can state the custodial rights of a grandparent and/or person who stands in loco parentis to the child(ren) in the event of a parent’s death. This type of agreement would be modifiable by a court, but would at least weigh in favor of the wishes of the decedent. Standing (the right of a person to be awarded custodial rights) should be discussed with a family law attorney prior to negotiating such an agreement. Raffaele Puppio family and estate lawyers ensure that clients are provided estate planning advice in conjunction with their divorce. 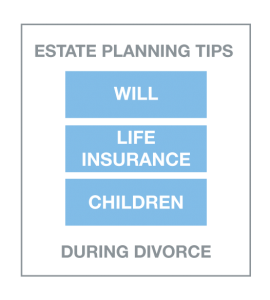 If you have any questions regarding estate planning or family law, contact one of our attorneys at 610-891-6710.